Defeat is not an option for both sides on Friday night as Newry City AFC entertain Glentoran in the Danske Bank Premiership at the Showgrounds. Both teams have not had the season to date that they would have been looking for. The home side have lost their last six league games and are sitting in 11th in the league standings with only 16 points on the board. It is changed days since they won four promotions in five seasons and manager Darren Mullen knows they need to get points on the board and soon. “When you reach the end of the season every game is a must win game. “But are we going to win every game between now and the end of the season? The answer is no. “But we need to make sure we pick-up more points than we have been doing. And Mullen says he was disappointed with his side’s display in their 2-0 defeat to neighbours Warrenpoint Town last weekend. “There were very few positives to take out of it after playing so well against Linfield just before it. And to put in a performance like that was disappointing and the defending for the goals was not great. “We didn’t create enough and it was a local derby and we didn’t perform the way I thought we would perform. 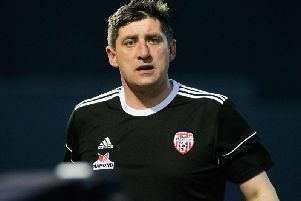 “We have a chance on Friday night against Glentoran and we had a meeting after training the other night and we agreed that these were the players, staff and group that are going to get us out of this situation and we all have to work harder - including myself- to make sure we stay in this league. “So lots of tough games coming up but there can be no excuses for Friday night as we are ready for it,” added Mullen. And Glentoran manager Gary Smyth also admits that this is a ‘huge’ game for his side after their defeat to Linfield. “Tomorrow is a must win because if we do win it jumps us up two positions. That as our aim. To beat Institute in my first game was a huge boost and this is another massive game. “This is a tough game but it is a must win one for us,” said Smyth. And since taking over the reins from Ronnie McFall a few weeks ago Smyth says the players have responded to his methods in a very positive way. “I couldn’t ask for anymore. They have given everything and it has been brilliant. “Work rate, aggression and they have show lots of character. “The last time we met we were 1-0 down and came back to win the game. “We also had a massive test against Linfield the other night and even though we didn’t win we did not disgrace ourselves and I thought once again we showed plenty of character to come back against the Blues. ”And against Newry on Friday night we will have to show that same character again and then some if we want to get a result. “Because going to Newry is always very, very difficult. “And Darren Mullen always sets his teams up well and they always work hard and put in loads of effort as we will bring down as big a support as any other team in the league, so they will be up for it,” added Smyth.